How do celebs get those flawless, touchable beach waves? Wavy hair is a pretty seasonal look here in the low-country and is very adored by A-list celebs. There's just something so priceless and fun looking when you rock this style. Since it's not exactly beach weather here (yet), we figured we'd let you know the way we get this look without having to hit up Folly. This style is a pretty simple one to achieve. Want beach waves but can’t go to the beach every day? Bring the beach with you! Try using a sea-salt spray that has a touch of oil or other natural soothing ingredients in it. Spritz it through your damp hair and let it air dry. Yeah, it's that simple. We have Bumble and Bumble Surf Spray, which is best for people whose hair tends to get a little greasy through the day. It will help soak up some of that oil. Then we have Bumble and Bumble Surf Infusion. If your hair gets a little dry this would be the one you'd want. We also have a Bumble and Bumble Surf Foam spray, which can be used wet or dry and works for just about any hair type. Sea-salt spray can add gorgeous waves to your hair, but sometimes it’s just not enough. You'll really understand this is you have very fine or straight hair. To add extra volume and some more waves, try using a large curling iron (we recommend a two-inch barrel). Make sure to twirl your hair away from your face in the front, and then altering curls as you go back. Let your hair rest and cool off something then run your fingers through it to give it that lived in look or use a very wide tooth-comb. *SURF INFUSION SPRAY- This oil-infused salt spray enhances texture for sea-tossed waves with a little bit of shine. WHO IT'S FOR: Medium to thick. Straight to wavy. Healthy and/or a little dry. HOW TO USE: Shake well (it should look like crashing waves when ready). Mist onto damp or dry hair and let if air-dry or diffuse. *SURF SPRAY- A sea salt spray that adds volume, textured hold with a matte finish. Beachy waves even during those chilly months. WHO IT'S FOR: Fine to medium. Straight to wavy. Healthy. HOW TO USE: Spray evenly onto damp or dry hair. Squeeze and twist strands to enhance texture. Air-dry or diffuse. 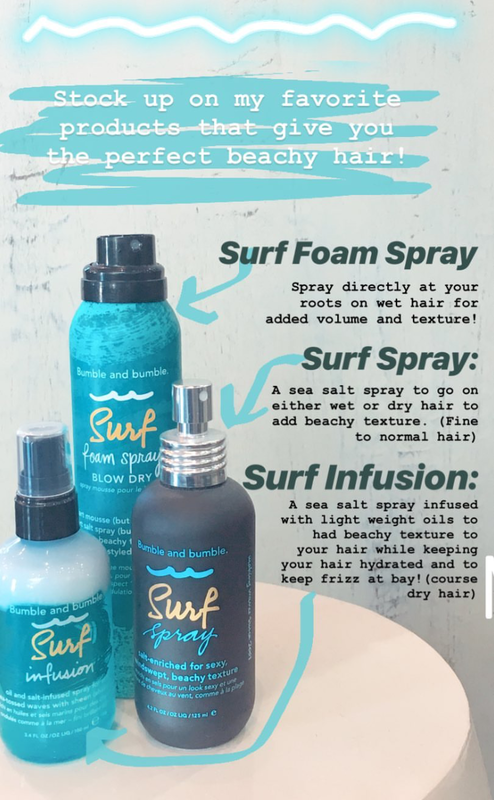 *SURF FOAM BLOW DRY SPRAY- Mousse and a salt spray had a baby, and that baby is surf foam spray. This product will give you big, beachy texture with heat-styled polish. HOW TO USE: Shake well. Mist onto damp hair. A little goes a long way. Then distribute evenly with fingers. Blow-dry with a brush for a polished look, or use your hands for more of a wild windswept look. *SURF SHAMPOO AND CONDITIONER- A daily cleanser for buoyant body and soft, beach texture. Light, but moisturizing. HOW TO USE: Shampoo- Work a dab through wet hair, lather well, and rinse thoroughly. Conditioner- After cleansing with Surf Foam Wash Shampoo, smooth through mids to ends. Let sit for a minute then wash thoroughly. Also be on the look out for our post on some new surf scents. 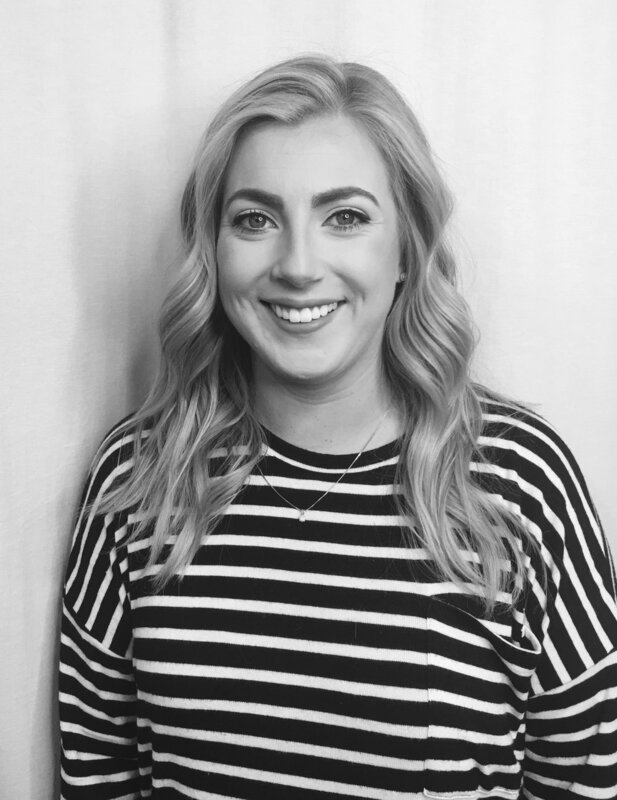 Get to know her: Kelsey loves going out on the boat with her husband Randy and just being on the water with him and her fur-babies. She's obsessed with her dogs Bobby who is 6 and Charlie who is 7 months old! Kelsey is a local gal who went to Wando High, University of South Carolina, and to Paul Mitchell. She is in love with all things Nashville, Tennessee. October will mark her 4-year mark of doing hair. Her specialties are: She specializes in blondes, lobs, long layer cuts, and bridal makeup. Bumble and Bumble top three: All Style. "It has changed my life! I love how it makes my blowouts last!". Pret-a-Powder (the original). "This is my all-time favorite dry shampoo. I love that it adds volume and hides my roots hahah". Save the Day. it brings hair back from the dead. Which stylist at our salon inspires you the most: "Ashley! She is everything I hope to be as a stylist! she does the best blondes in town and I learn something new from her every day. She is so kind, talented, and her guest always leave looking and feeling like a million bucks!"